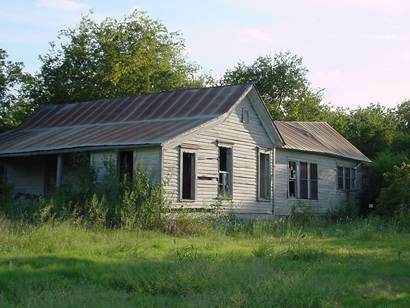 Corn Hill Texas, Texas Hill Country Ghost Towns. In 1855 a Judge named John E. King built his residence atop a topographical feature called Corn Hill. The house served as a stop for the stage line connecting Georgetown and Fort Gates and a post office was granted the same year of 1855. The town had an uneventful history until the 1870s and 1880s. The first store was opened in 1869 and a gin two years later. In 1884 Corn Hill the town had 250 people with two mills, a Masonic lodge, three gins, a newspaper, and the Corn Hill Academy. By 1896 the population was 350 in 1896 and the town's high-water mark came around 1910 when an estimated 500 people lived here. 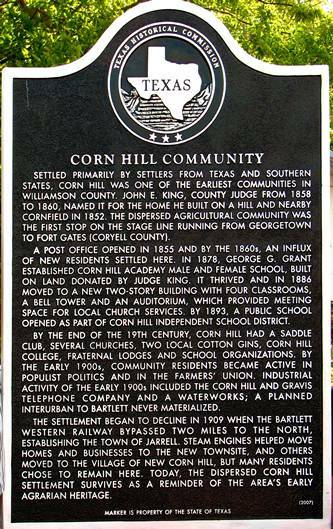 The Bartlett and Western Railway bypassed Corn Hill, and the town of Jarrell was established alongside the rails. 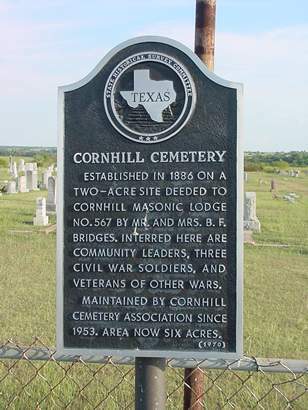 Corn Hill received a death blow during the period 1910 to 1920 when all the people and most of the buildings (including the post office) moved to Jarrell. Today only a few buildings still stand. 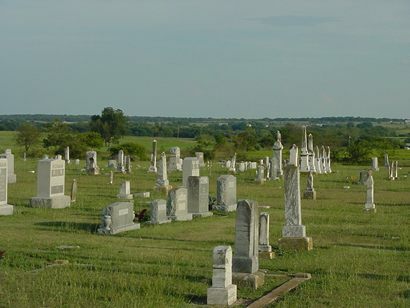 The old city cemetery is less than a mile east of what had been the town. It offers a sweeping view of the countryside and a distant view of the church at New Corn Hill. 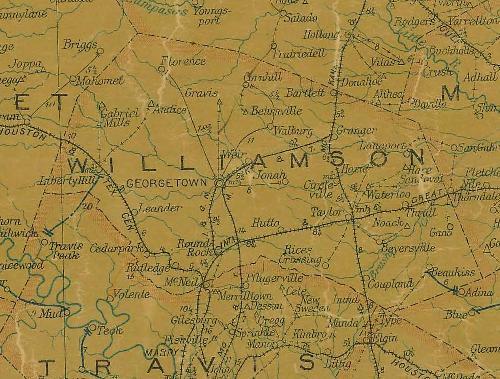 Settled primarily by settlers from Texas and southern states, Corn Hill was one of the earliest communities in Williamson County. John E. King, county judge from 1858 to 1860, named it for the home he built on a hill and nearby cornfield in 1852. 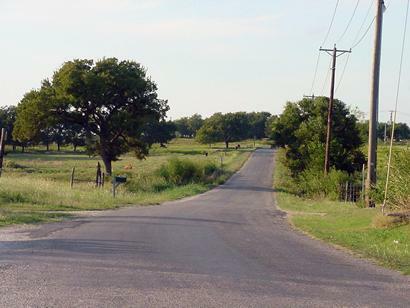 The dispersed agricultural community was the first stop on the stage line running from Georgetown to Fort Gates (Coryell County). A post office opened in 1855 and by the 1860s, an influx of new residents settled here. In 1878, George G. Grant established corn Hill Academy Male and Female School, built on land donated by Judge King. It thrived and in 1886 moved to a new two-story building with four classrooms, a bell tower and an auditorium, which provided meeting space for local church services. By 1893, a public school opened as part of Corn Hill Independent School District. By the end of the 19th century, Corn Hill had a saddle club, several churches, two locl cotton gins, Corn Hill College, fraternal lodges and school organizations. By the early 1900s, community residents became active in Populist politics and in the Farmers� Union. Industrial activity of the early 1900s included the Corn Hill and Gravis Telephone Company and a waterworks; a planned interurban to Bartlett never materialized. 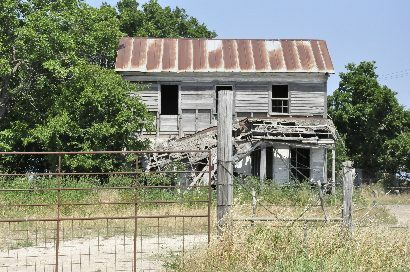 The settlement began to decline in 1909 when the Bartlett Western Railway bypassed two miles to the north, establishing the town of Jarrell. Steam engines helped move homes and businesses to the new townsite, and other moved to the village of New Corn Hill, but many residents chose to remain here. Today, the dispersed Corn Hill settlement survives as a reminder of the area�s early agrarian heritage. Recently I was given a printout from your article relating to the Corn Hill area of Central Texas. I am writing today, as after viewing some of the pictures you provided, it brought back memories of my early days. You see, I along with my sisters were reared in that Catholic Community, attended parochial school there, as well as some of us married in the large Church that still stands today, as well our Grandparents, Aunts and Uncles as well as many other members of the family and friends, that now, lie buried in the very same Cemetery you show in the pictures. I still have one surviving Uncle that lives to this day, directly across from the large Catholic Church and would be directly across from the few remaining buildings that you once again featured in your article. Oh yes, many memories, of the first Grocery Store that was just off the road, where I watched my first "World Series game between the Dodgers and Yankees. That would have had to be somewhere around 1950's. I also remember going to the Church activities as well as annual celebrations just below the hill at a place called "Moravian Hall". It was a two story structure, with a stairway leading upstairs to a wooden dance floor. Downstairs was reserved for Bohemian Taroks, Dominoes as well as refresments and delicious cakes pies kolaches sauage barbecue beer and much much more. Wonderful times, those ole days, and miss the greatly. My sisters as well as myslef still make our trips to that erea as often as we can, as most of our classmates and friends reside either in that area still, or the Austin, Texas area. My Mother and Father were buried there on top of the hill under the large oak trees just south of what use to be a ballpark. I playd ball there when I was in school, but my Father also spoke of the "big games" they had in a ballfield a bit farther down to the right. The school and most all, as you mention, are almost all gone, but the memories of the Catholic Nuns that gave us our early education and Christian way of life, still remains with us to this day. I will attempt to visit my Uncle within the next couple of weeks, as he will be celebrating his 103rd or 104th Birthday this year.. He has great knowledge of that entire area and lives alone, with the help of his Son.